Prepare to be blown away - this watch is Sinn's crowning achievement and features a movement so advanced that only a very small number are built each month. As we have traveled the country showing the Sinn Collection through our Road Shows, the Sinn TESTAF Certified Professional Pilot's Series has stood out in every city. Many watch brands classify their watches as "professional pilot's watches", but Mr. Schmidt knew that this was a hollow phrase that had absolutely no substance behind it. He set out on a journey to encourage the independent development of a set of standards to which a watch must conform to be classified a certified pilots watch, and TESTAF was born. Mr. Schmidt recently spoke with us and indicated that DIN will adopt the standards set by TESTAF for professional pilots watches. He expects this action to be taken in the next few years at which time there will no longer be confusion about what is a true certified professional pilots watch. The new Sinn EZM 10 TESTAF DIAPAL was tested and certified to the "Technical Standard for Pilot's Watches" (TESTAF) by the Aachen University of Applied Sciences. This establishes its suitability for professional use as a pilot's watch, and includes a certificate and the "TESTAF" quality seal on the dial. The Sinn EZM 10 TESTAF is the first watch worldwide that been tested and certified to the new Technical Standard for Pilot's Watches (TESTAF). Each watch will be shipped with a special signed certificate indicating that this watch bears a serial number which is within the range of those watches approved by TESTAF. 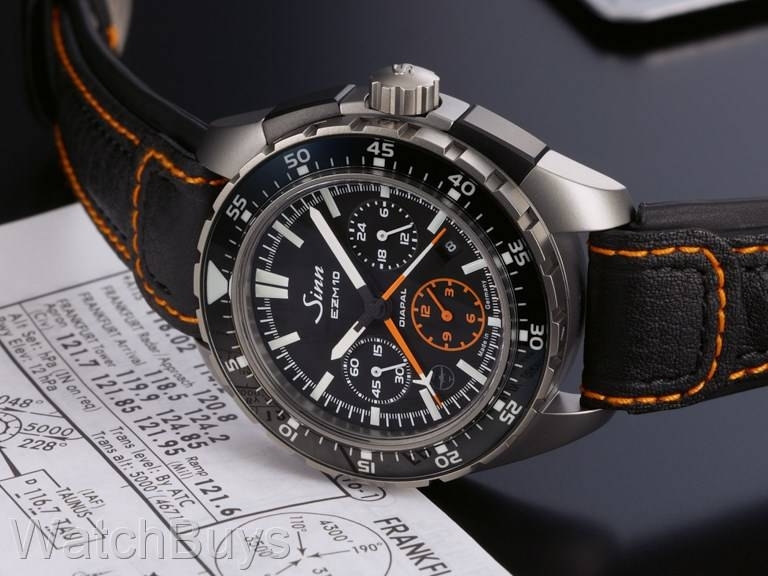 However, Sinn didn't want to make just a pilot's watch. They also wanted to make the most technologically advanced Mission Timer (EZM) to date, by including an extensive range of additional features. To start, at the heart of this chronograph is the all new Sinn SZ-01 movement, which features a center-mounted 60 second stopwatch hand. This special technical feature yields two benefits: first, 60 minutes are now counted in one sweep of the hand instead of the usual 30 minutes, and second, the minute stop scale covers the entire diameter of the dial meaning that the measured times can be read off immediately. Additionally, the chronograph hands are luminous, and thus perfectly visible even in the dark. This function is complemented by an all-new minute-ratcheting sapphire pilot's bezel, which allows for the numerals indices and main maker to all be lumed. Also in use for the first time is a fully-tegimented case made entirely of high-strength titanium at Sinn's case making manufacture in Glashutte, Germany. The Tegiment process, Sinn's patented case-hardening technology, was previously available only to those watches which featured a stainless steel case, which is quite heavy in comparison to titanium. As a large watch, the Sinn EZM 10 TESTAF would need to be light enough for daily wear, yet also tough enough to resist scratching in an often cramped and busy cockpit environment, and thus the process to Tegiment titanium was invented. Th EZM 10 and EZM 9 are the only such watches in Sinn's current production to feature Tegimented titanium. This new watch features the very latest construction of Sinn's patented DIAPAL oil free escapement. "An engineer was looking for a chrono..."
Verified Owner Comments: I ordered this watch last Tuesday and received it in San Diego early Thursday morning (great shipping), This is a great watch (no complaints so far). I have been looking for a rugged chronograph that can get wet and just be an every day watch you don't have to worry about hitting something hard and scratching your nice watch. Watchbuys has great customer service. This is my first Sinn watch, but not my last. Thanks watchbuys!! "Maybe the best Sinn ever"
Verified Owner Comments: This is my 3rd Sinn. I think it's the best although I love my U1 and EZM13. This watch does it all and the lite weight and build quality are exemplary. The ceramic countdown bezel is fantastic and it's lured so even more useful. I also love the strap and won't change it. Verified Owner Comments: Excellent watch. Has almost all of Sinn technologies. Big but very light and comfortable to wear. Looks great on my 170cm wrist. There's a tiny chip under the sapphire bezel that reflects light, other than that excellent build quality. The chronograph has crisp pusher action. The bezel also has satisfying click with no play. The Chronissimo strap is high quality, durable and comfortable. Verified Owner Comments: First of all, I must mention the great customer service from Watchbuys. This was my first purchase, and I called immediately upon placing my order to understand the process. The customer service representative couldn't have been more helpful or courteous. All my questions were answered, and my Sinn EZM 10 was on its way to me. It arrived just as expected. Packaging was well done, and the watch was set to the correct time within about 2 seconds - a nice touch. The Sinn EZM 10 has exceeded my expectations. As advertised, it is a highly legible pilot's watch...so much so that I've received several comments on how striking it is. This is my first Sinn. The quality and attention to detail are outstanding. The long list of innovative technical features are impressive...it's great to know they are there. The chronograph movement is extra special. The central 60 sec and min hands make it an extremely usable chronograph. Overall...wow! Verified Owner Comments: The watch specifications speak for themselves. It's the pinnacle of Sinn's tek. I couldn't be more pleased with the fit, finish and function. I have 7.25 inch wrists and it disappears, largely because of the titanium construction. Service is fantastic. I'm a repeat customer for good reason. The staff are really into watches and not simply selling for the sake of sales. Verified Owner Comments: Great watch, highly functional and very understated (for a large titanium watch). Perhaps the best tool watch on the market, and certainly the best priced. The titanium case and band are very scratch resistant, the sapphire bezel is highly readable and also scratch resistant, and the central minute hand makes this the most legible chrono available. Verified Owner Comments: A perfect work watch. As large as it is, it comes in at only 117 grams. That is as light as my Rolex GMT master which is less than 1/2 the size. The best thing about the purchase was the great customer service and how easy it is to get a knowledgeable person on the phone before and after making the purchase. Verified Owner Comments: It's been a pleasure doing business with WatchBuys - customer service is outstanding. As for the watch, I like it a lot. Has the in your face look that got my attention. Plus the Sinn quality. Having said that, I do think that the watch is over priced. For that kind of money it should have included the bracelet. All and all I'm happy with the watch, it's all that you would expect from the Sinn line up. Verified Owner Comments: This is one great looking watch! It's imposing, but surprisingly light thanks to the Titanium construction. The black leather band with the orange stitching is very sturdy and makes this watch pop even more. The regular size for the wristband was too small, but WatchBuys had a long version readily available and that fit perfectly.